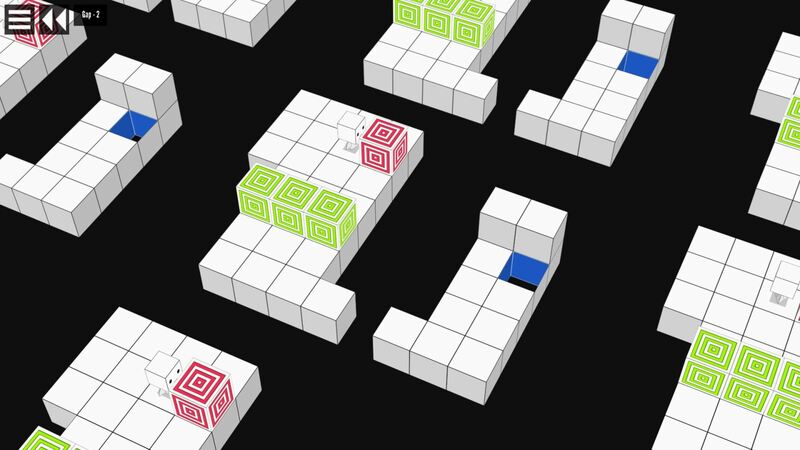 Block puzzlers are a dime a dozen, sure, but where most tend to keep things relatively simple, Test Chamber will truly test your perception skills with its isometric screen wrapping. This mechanic allows for some quite clever puzzles, and it’s not long before reaching the exit turns into a headspinningly difficult challenge. But is it any fun? Definitely! On top of that, the minimalistic design is just plain awesome. That said, the complexity does seem a tad on the crazy side, as I would often get stuck for a noticeable amount of time, even in the early levels. Could be that I’m just terrible a puzzles though, or… maybe such design was entirely intentional? Hard to tell, so I’m gonna go with ‘a bit of both’. Each of the 28 levels does rate your performance based on number of moves, but this is more of a virtual trophy’ thing, than something related to progress (as in, no silly level gating). You will have to finish a level before moving onto the next though, and because of this, I only got to experience the first eight before I had to throw in the towel. I was more than a little eager to travel further, see what else the game had in store for me, but alas, ‘Rescue’ is where my quest to find this so-called Infinite World ended. 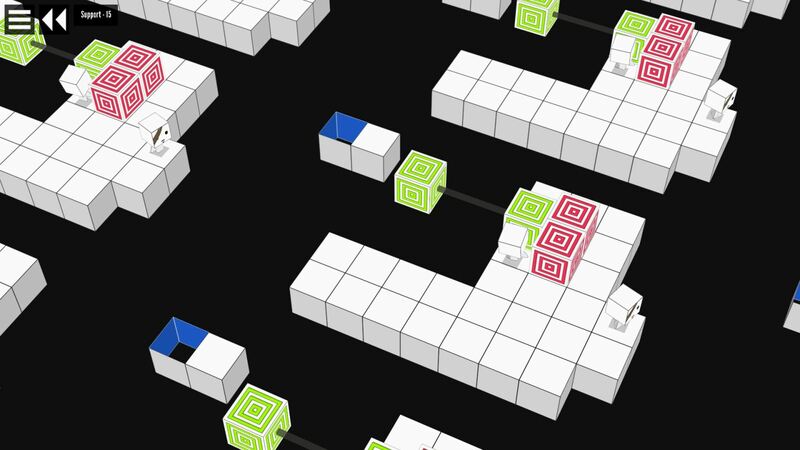 Seeing how all the block-pushing can easily create an unsolvable level, even with careful planning, that step-by-step undo feature’s bound to come in handy. Shoving a block over the edge, only to realize a minute or two later that you actually needed it to progress would be a pain otherwise. Especially since there are times when the solution won’t be immediately obvious, a bit of trial and error is not uncommon, in an attempt to bridge every gap. If you thought moving 1×1, 2×2 and 3×3 blocks around was tricky, well, you’re not gonna like the ‘linked’ ones. While useful in bridging several gaps at once among other things, their unique design also means even more planning is required whenever they’re part of the equation. Blocks not directly connected to something will drop off the edge after all, never to be seen again (unless you make use of the undo feature, of course). The world-wrapping mechanics of the world of Test Chamber create unique and devious puzzles that will challenge even the most skilled players. No kidding! In spite of my being unable to finish even a third of its levels, I still enjoyed Test Chamber though. Sure, the game might be too hard for some, but unless you’re the overly impatient sort and/or utterly dislike complicated brainteasers, I’d definitely recommend picking this one up. Besides, when was the last time you got to go on an adventure and push blocks around, in search of… the Infinite World? Exactly. Test Chamber is available for Windows (itch.io, $2.99) and Android (Google Play, free).